Dubai International Airport was forced to ground flights for half an hour due to a drone flying in the area, the airport says. It said airspace around the airport closed just after 08:00 local time (04:00 GMT) on Wednesday because of "unauthorised drone activity". Arrivals resumed at 08:35, with full operations restarting by 09:07. It is not the first time drones have delayed flights at the airport, one of the world's busiest. "We remind all [drone] operators that activities are not permitted within 5km (3.11 miles) of any airport or landing area,'' Dubai Airports said on Twitter. 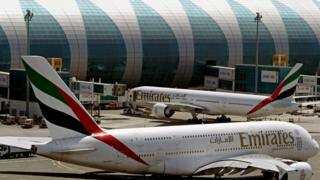 On 12 June a similar incident saw Dubai International Airport close for 69 minutes. In the wake of the incident, authorities in the United Arab Emirates have announced plans to tighten the rules on buying and using drones. Drone owners must already register with the UAE General Civil Aviation Authority.